There is appalling madness going on in Zimbabwe at the moment, the country has literally lost its socio-political and economic compass. Zimbabweans and the international community watch with astonishment as policy discord is normalised in our once great nation. The disparity of the views being expressed by senior government officials is shocking. Whatâ€™s worse, President Robert Mugabe who is the countryâ€™s Chief Executive does not bother trying to clarify his governmentâ€™s policies, assuming he still has the capacity to do so. Instead, the President seems to be enjoying the policy catfights and the bruises as ministers outdo each other in the retrogressive game of policy inconsistency. The presidentâ€™s lack of policy leadership – a trademark of his misrule, has left his lieutenants fighting each other and making fools of themselves. Lunatic views are being peddled to gullible audiences as â€˜policyâ€™ by what can only be described as opportunist ministers trying to make themselves relevant as they claim to understand the Presidentâ€™s views better than everybody else. The discord has virtually made it impossible for any serious investor to make long term investment in the country â€“ one reason why investors want to get their return as quickly as possible and get out as we saw in at Chiadzwa. In government, the monumental madness keeps rearing its ugly head. Quite often, we hear of things uttered by government ministers that just do not make sense. According to Zimbabweâ€™s Minister of Youth, Indigenisation and Economic Empowerment Patrick Zhuwao, Zimbabwe â€˜does not need Foreign Direct Investment (FDI)â€™ and suggesting otherwise is â€˜ungodlyâ€™ or â€˜unpatrioticâ€™. The Youth minister goes on to suggest that those who advocate for FDI are denouncing President Robert Mugabe and â€˜interfere with the boy Ministerâ€™s portfolio. They are also agents of regime change. While the minister has his right to express himself including peddling senseless views or simply exposing his sheer ignorance, his warped view on FDI must not go unchallenged. In this day and age, a government minister of a country that is supposed to be a member of the international community of nations brings us shame if he stands up in front of the world to say such nonsense. I hope he is not ignorant to the extent of not realising that each time his uncle gallivants all over the world looking for multimillion -dollar deals with the Chinese, that is Direct Foreign Investment he will be desperately hunting for. That he has always returned home empty-handed is more about the iniquity of his policies than irrelevance of FDI. More likely than not, this is just a desperate attempt on Zhuwaoâ€™s part to make himself relevant. Even patriotic diehards agree that Zimbabwe desperately needs investment and is ill prepared to cherry pick. Contemporary economies have made it necessary that every country including China and the USA needs both domestic and foreign investment to grow. Economic growth that is tittering at the bottom after shrinking by more than 40%, unemployment that is estimated at around 90% and tight liquidity in the country suggest that Zimbabwe should be the last country to utter such nonsense. The country desperately needs investment, now. Economies need investment to create future productive capacity and replace old equipment and machinery. Such investment is a key determinant of future economic growth and investment is either domestic or foreign. The â€˜foreignâ€™ and â€˜domesticâ€™ is a description of where the investment comes from. Even inflows from the Zimbabwe diaspora if channelled to investment fall under FDI. If Patrick Zhuwao agrees that his uncleâ€™s government desperately needs to improve peopleâ€™s livelihoods, he must accept that Zimbabweâ€™s economy needs to grow to increase the size of the economic cake. His views against FDI, suggests that the nephew minister believes that Zimbabweâ€™s domestic investment is large enough to spur the much needed economic growth. The problem is that Zimbabweâ€™s domestic investment is woeful, or more aptly, awful. If anything, most of the local players are nothing but â€œsubsistence and speculative investorsâ€, including the youthful and uninformed minister whose ascendancy to the ministry was more of a result of family relationship than merit. There are several Zimbabweans in and out of Zimbabwe who could do a much better job, only if they were Mugabeâ€™s nephews or nieces! There are a number of variables that can be used to measure domestic investment and one of them is called â€˜gross domestic savingsâ€™ which is usually measured as a percentage of Gross Domestic Product (GDP). Calculated as a percentage of income, gross savings is the amount of money that an economy sets aside after total consumption (consumption today versus consumption tomorrow), in other words the amount of money that we set aside to ensure that we have a better future. There is general agreement that what we save today has impact on future economic growth. Some countries have great tradition of saving others are not so great. One country with a great record of gross domestic savings is China which saves approximately 50 cents out of every dollar they make. Much closer to home, not long ago, Botswana had more than 30 billion Pula stashed in foreign reserves. The benefits of those many years of saving are now there for anyone to see. On the other hand, Zimbabweâ€™s gross savings record is very poor. Chart 1 below shows Zimbabweâ€™s gross domestic savings as a percentage of GDP for 40 years since 1975 (source: world bank). We have included figures that cover previous â€˜sanction periodsâ€™ for readers to judge for themselves the sanctions mantra. The chart shows that Zimbabwe is consuming more than what it is producing and this has been the case for more than a decade. Â While Zimbabwe is not the only country with negative gross domestic savings rate, the difference is that other countries actively encourage foreign investment to stimulate economic growth. Zimbabweâ€™s negative savings rate contrasts sharply with its neighbours. Chart 2 below compares Zimbabwe to her neighbours. A situation where gross national savings are negative and the country cannot attract investment from abroad points to a doomed future. In that process, the economic cake keeps diminishing. 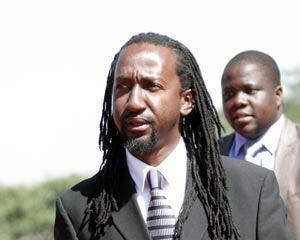 Mugabeâ€™s incompetent nephew, Patrick Zhuwao, believes that he can keep enlarging his own slice of the dwindling cake and has the audacity to make shameful utterances against FDI. Unfortunately, this means that everyone else gets smaller slices of a shrinking economic cake. One of the results, as we have seen over the years, is a terribly corrupt society where the entire nation is grossly impoverished with a few connected men and women living Hollywood lifestyles, albeit on borrowed time! So Zhuwao, our beloved country cannot afford the tyranny of the misinformed. If you cannot appreciate simple or basic economics, you would benefit the nation more by giving the platform to propagate investment policy to those who understand the policy issues at hand. You are disrespecting, patronising your audience and stunting the mental growth of the youth that ironically, your job is to nurture. We as a nation are getting fed up by all the â€˜institutional madnessâ€™ that seems to be contaminating our environment everywhere we go at the moment. If the worldâ€™s major economies continue to have appetitive for and sound policies to attract FDI, what is Zimbabwe to turn its back on what is required to get it working again? In simple terms, FDI is like blood transfusion; if your own system has run out of the capacity to produce blood or you have lost so much of it, you can only survive if there are stocks from blood donors in a blood bank. Only a mental patient, like Patrick Zhuwao, would refuse blood transfusion when seriously in need and against medical advice. The comatose Zimbabwean economy critically needs some transfusion and life support to prevent total collapse. It only takes a challenged, myopic and patronised mind like Patrick Zhuwao to think otherwise.